1. Preheat the oven to 400 degrees. While the oven is preheating, chop the broccoli and onions. 2. Add the almond milk to a medium saucepan over medium heat. Whisk in the flour, tahini, and nutritional yeast. Continue cooking for another 5 to 10 minutes, whisking often. 3. Spray a baking sheet with olive oil, and place the pre-baked shell on top. Spread the tomato paste evenly over the shell. Add the garlic. 4. Once the "cheese" sauce is ready, spread it out evenly over the shell. Top with the broccoli, onions, salt, and pepper. Add more cheese sauce as desired. Bake at 400 until the crust in golden-brown, 15 to 20 minutes. Wow, that pizza looks great! It was really good! I ate the whole thing by myself. Lol. That looks so good! 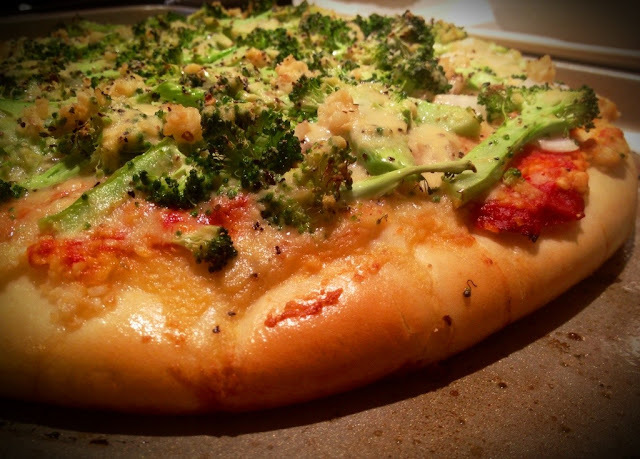 I love broc' on a pizza. Me too...broccoli's good on pretty much anything.